Both my parents were keen tennis players and to enhance their skills they built a volley board in our back yard. It was quite an edifice; with a single tennis court size concrete pad in front and the height of the board itself was about the same as the cross bar of a rugby goal post. In the winter months I could use this to kick a football over and as a result I became a fairly proficient at goal kicking. At the commencement of the rugby season the coach would inevitably ask the assembled team: “Who fancies themselves as a goal kicker?” Three or four of us would generally step forward and I would often win the ensuing contest and so become the designated goal kicker. I played on the wing for a time and then as a flanker or number eight and back then it was mystery to me why the All Blacks goal kicker was always the fullback. Surely there were locks or hookers or centres whose parents had volley boards in their backyards and had honed their skills as goal kickers to be at least as good if not better than the fullback. All this changed of course when Grant Fox came along. Overnight it was the fly-half’s who took all the kicks. It didn’t matter if they couldn’t kick their way out of a paper bag; think Beauden Barrett in the test against the Wallabies a couple of weeks ago. If he’d managed to slot a few through the posts Michael Cheika might have looked like a real clown. Scrums these days are always collapsing on themselves, causing injuries to the players and frustration to the viewers as the game gets held up endlessly and you can only make so many cups of tea while waiting for the restart. Penalties for scrum infringements are given by referee guesswork which satisfies no one. 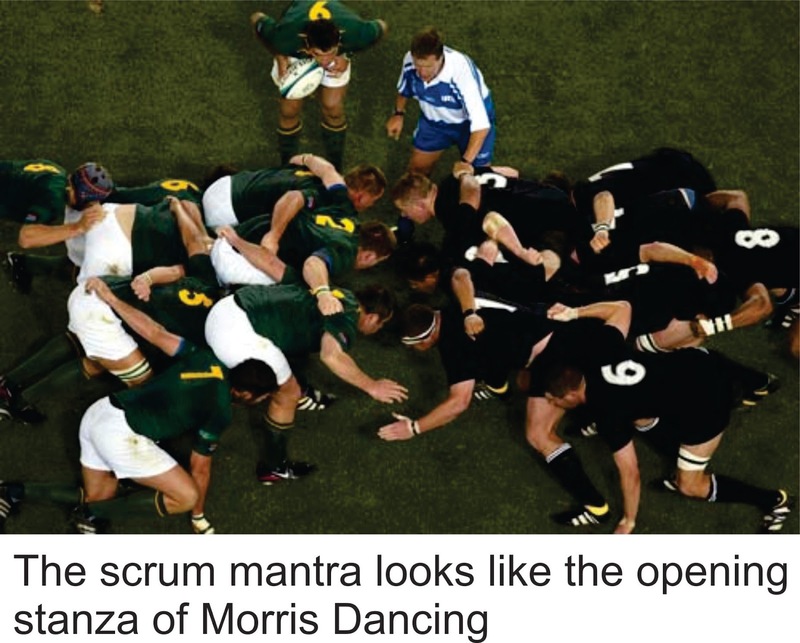 Add the laughable mantra “crouch, bind, set,” and then the referee indicates to the half back, often with a pat on the bottom - which I find curious - that it’s now time to put the ball into the scrum and the whole machination starts to look like the opening stanza of Morris Dancing. And don’t get me started on the TMO’s. Stevie Wonder could do a better job than most of them. Endless replays that the viewer scrutinises, the stadium crowd examines on the big screen and the referee observes from the field never coincide with the opinions of the TV commentators. Somebody has got to get it right and it’s usually me, but my opinion is never sought. If that volley board was still around I’d go and bang my head against it.